Previously the Disney Film project podcast learned how to throw down like a princess when they reviewed The Princess Diaries back in Episode 31, and more recently they traveled to Genovia to review The Princess Diaries 2: Royal Engagement in Episode 72. These movies tell the story of a your girl named Mia and her transformation from a awkward teenage girl into the Princess and then Queen of the country of Genovia. The movies star Anne Hathaway as Mia and Disney Legend Julie Andrews as her grandmother, the Queen. Recently Disney provided me with a preview of the 10th Anniversary Blu-ray release set of both movies to review. I was pretty excited to be getting this set, considering it being a 10th Anniversary edition, and its tie in with the Julie Andrews and Disney hosting National Princess Week back in April. After all, there’s a lot of opportunity to be had, considering that even with both movies on the Blu-ray, there’s plenty of space left for extras. Unfortunately the opportunity was missed. There were not even any Trailers for other movies on this release, not even on insertion of the Blu-ray disc into my player. You simply arrive at the Main Menu, which shows just a few quick scenes from the movie. The movies come with 3 audio and subtitle tracks: English, French, and Spanish. 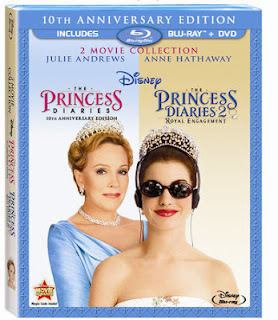 And scene selection is mismatched, with 27 selectable scenes in The Princess Diaries, but only 12 for Princess Diaries 2 - which is not a divergence from either DVD release. Playing the movie is fairly straightforward as well, with no special pausing features outside of scene selection. The only actual bonus features on the Blu-ray are a series of outtakes and bloopers for both movies which had appeared on the DVD releases. Gone are the other DVD extras that filled those releases like Deleted Scenes, music videos, audio commentary by Julie Andrews and Anne Hathaway, etc. It’s a shame that more wasn’t done with the opportunity presented by this release. After all there could have been a better tie in with National Princess Week instead of the two seeming like separate events, additional commentaries, etc. The quality of the movies themselves is great, and really the only reason to get this Blu-ray update. Fans may want to hang onto the DVD copies or they’ll lose all the DVD extras as effectively these are just remastered versions of the movies on DVD, with no additions.